After a long day, isn’t it nice sometimes to just come home, put on your most comfortable pair of lounge pants (you know, that pair that you’ve had for 4 years that you just can’t let go of) and quickly toss together a comforting, irresistibly filled and piled high with cheesy goodness, grilled cheese sandwich. Then to enjoy it hot of the griddle with all the stringy cheese, mmmm mouthwatering. I call it grilled cheese bliss. 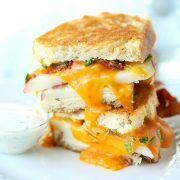 I love building grilled cheese sandwiches because there are countless combinations of what can be created and you have a simple yet satisfying meal in a number of minutes. 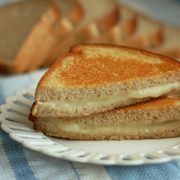 The other great thing about grilled cheese is the amount of flavor you can get with so few ingredients. 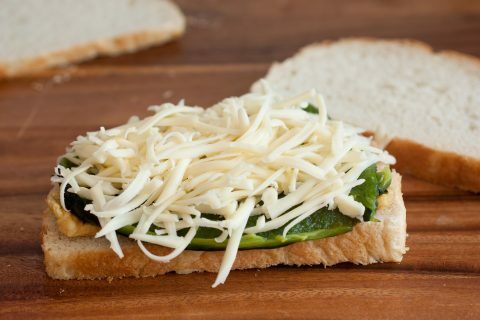 It’s possible thanks to the key ingredient, the abundance of flavor packed cheeses that are available. Cheese is one of the greatest foods ever. I’ve made three different kinds of grilled cheeses to join in on the celebration of grilled cheese month (yeah grilled cheese is so amazing it’s earned a whole month of celebration. I want to figure out how to do this for my birthday =)). 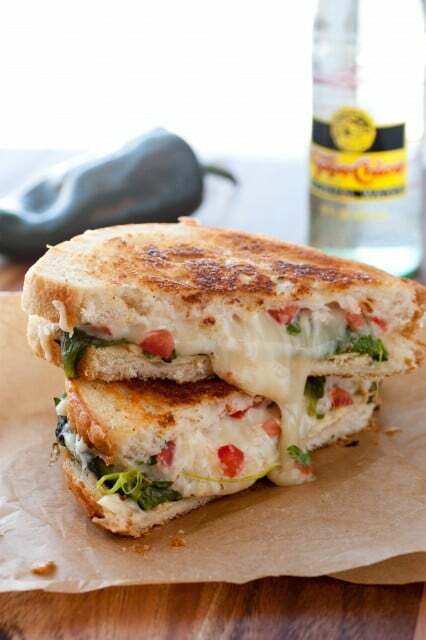 This one is two amazing foods in one, grilled cheese along with a twist on a classic Mexican dish, Chile Relleno. Rather than stuffing, dipping and frying a Chili Relleno, I layered the ingredients while keeping all the same flavors. 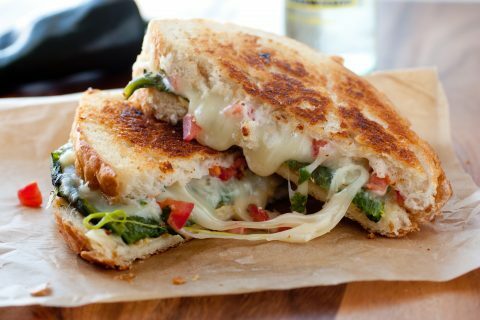 Grilled cheese lovers, put this at the top of your must make soon list. 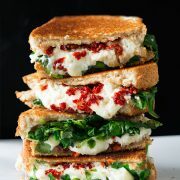 Two comfort foods collide for one unforgettable grilled cheese sandwich! Set oven rack two levels below broiler element and heat oven to broil. Line a baking dish with foil and set Poblano pepper on foil. Transfer to oven and broil pepper, rotating frequently, until skin has blistered and charred, about 8 - 10 minutes. Transfer pepper to an airtight bag, seal bag and allow to rest 5 minutes, or until cool enough to handle. Remove from bag and peel pepper, cut off top, make one slice down length of pepper. Remove and discard seeds and ribs. Pat inside of pepper dry with a paper towel, set aside. Heat 2 tsp oil in an 8-inch non-stick skillet slightly over medium heat. Whisk egg vigorously in a small bowl until frothy, 1 minute. Once oil is hot, carefully pour egg into pan. 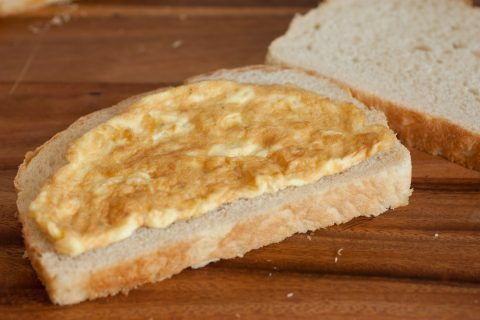 Cook egg until golden, about 10 seconds, then using a spatula, fold egg into a half (as if you were making an omelet). Continue to cook just until nearly cooked through, about 10 seconds longer per side then transfer to paper towels to drain, set aside. 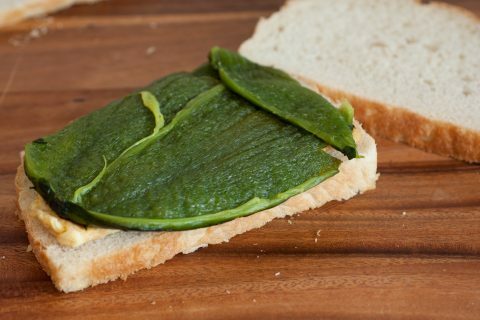 To assemble sandwich, brush 1/2 tbsp butter on outsides of bread. 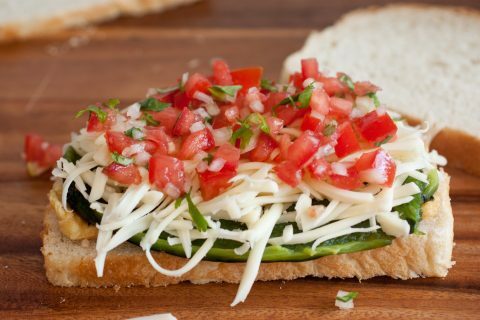 Layer egg on bread, followed by roasted Poblano pepper, grated Wisconsin Monterey Jack cheese and sprinkle top with half of the pico de gallo (reserve remaining pico de gallo for another use). Using paper towels, wipe oil from skillet. Heat skillet over medium-low heat. Carefully transfer assembled sandwich to skillet. Cook until bottom is golden about 4 - 6 minutes, then rotate sandwich to opposite side, cover skillet with lid and cook opposite side until golden brown and cheese has melted through, about 4 - 6 minutes. Serve immediately. Combine diced tomato, onion, garlic, cilantro and lime juice in a small mixing bowl. Season with salt and pepper to taste.